Acne. The mortal enemy of so many of us. My journey with acne started out super young and was a full on battle for about 20 years. During that time I tried ever single thing under the sun to clear up the huge, painful cystic acne that constantly hung out on my cheeks: every topical prescription, alllll the Neutrogena products, Accutane, Spironolactone and too many birth control pills to keep track of. As I delved more into holistic wellness, I thought at least a few of the changes I was making would turn my skin around including switching to all natural makeup/skincare/body products, using only non-toxic household products, drinking hot lemon water, popping probiotics, cutting out dairy...I did a few juice cleanses, I tried cutting gluten and corn, I went vegan and I even did the whole raw vegan until 4pm business. I felt so defeated. Like I tried everything except for a face transplant and couldn’t find relief. I felt gross and honestly ugly. It made me so self-conscious and then unprofessional as I got older and started working, meeting with clients and attending trade shows. I thought my skin would be like that for my entire life. Finally, a couple of years ago I decided to cut out soy as a last ditch effort. I knew that there were links between soy and hormonal imbalances, but I wasn’t consuming a lot so I didn’t think it would make a big difference. To my utter surprise, the cysts cleared up within a few weeks. Just like that my 20 year old battle with mysterious cystic acne was solved. I was almost mad - like that was it? All that effort, embarrassment, pain and scars just because of soy?! Of course, I’m insanely grateful I discovered the intolerance, but it felt anti-climatic, you know?. But now if I eat anything with some soy - bam. Guess what I wake up to the next morning? So you better believe I try to avoid it like the plague. Now that doesn’t mean my skin is perfect. I still deal with some hormonal breakouts, congestion and of course, scars. It can be a bit temperamental, so it took me some time to find a skincare routine that worked. And if that wasn’t complex enough, add in the need to keep my skin hydrated in harsh Chicago winters. What a combo. So what do I use? Glad you asked. Without further ado, I present to you my current skincare routine: the winter edition. I only wash my face in the morning if I’ve washed my hair to make sure no residual shampoo or conditioner is hanging around to clog pores. Otherwise, I run a cotton pad with Thayer’s Witch Hazel Toner with Rose Petal over my face and neck for a little refresh. While my skin is still slightly damp, it’s time for serum. I massage in about 3-4 drops of West of South’s Prickly Pear Serum* all over, but concentrating on my cheeks (gotta fade those scars). I’ll let this absorb in a bit to soak up the goodness before moving on. After a minute or so, I spray on Pelindaba Organic Lavender Hydrosol to dampen my skin again and for its healing and soothing properties. For $6, this was a surprising little addition that I love. Next comes the hydration. First I pat in Iremia Skincare Protective Creme*. It’s thick and luscious and so nourishing. For daytime, I’ll use just a tiny bit - maybe a dollop the size of my pinky nail. Immediately after that, I massage in about ¼ dropper full of Iremia Skincare Restorative Facial Oil*. Layering moisturizers is key to staying hydrated during the winter. The multiple levels create barriers against the elements, but they don’t feel heavy at all. I’ll wait a few minutes before applying makeup so they really have time to sink in. The nighttime routine is very similar to the morning with some variations. First, I remove mascara with whatever oil or creme I have around. My favorite is almond oil which I’ll gently massage on and wash away with Heritage Store Rosewater & Glycerin Soap. I love this soap because it cuts through my makeup to give me a squeaky clean feeling without the tightness of other cleansers that strip your skin. It smells like fresh cut roses which adds in some nice aromatherapy and is super cheap! So glad I randomly picked this $5 gem up at the natural grocery store. Now here comes my secret weapon. A couple of times a week, I exfoliate my skin with the Tweezerman Dermaplaner. You would not believe the dead skin and peach fuzz this removes for me. It’s oddly satisfying and helps create a blank canvas for my skincare products. I realize it doesn’t have good reviews, but in my experience, it’s been great. I use very gentle pressure and don’t use it too often or go over any active breakouts. I seriously love this thing. I’ve also heard good things about the Tinkle Razors which might be my next purchase. Stay tuned. After that, a little swipe of toner followed by West of South serum OR SkinOwl Maqui Beauty Drops to switch things up. If I’m getting a breakout that I need to shut down fast, I’ll use a little Salicylic Acid from The Ordinary. Yes, I know it’s not a clean beauty product, but this works for me. I dab it on any areas of interest and let it absorb for a few minutes. It takes the redness and swelling down by morning and within a few days, it’s usually gone. The next step is hydration. I use a lot more moisturizer at night - about double the amount of Iremia Protective Creme or more. I apply it like frosting and can literally watch my skin drink it up. And again on top of that goes a generous serving of at least ½ dropper’s worth of Iremia Restorative Facial Oil to seal it all in. I like to give myself a nice little facial massage here and if you have a jade roller, now’s the time to whip that out. At this point I look greasy AF, but when I wake up with skin that doesn’t feel like a mummy I consider it worthwhile. Leahlani Honey Love Exfoliator* first thing in the morning (usually on the weekend). I splash water on my face, rub some of this on and let it sit while I shower. Afterwards, I give it a gentle scrub to wash off and I have a nice, exfoliated base for skincare. Cocokind Organic Chlorophyll Mask once a week at night after my skin has been washed. I mix it with plain water but you can get fancy with adding in diluted apple cider vinegar, aloe, a drop of tea tree oil or neem oil. It dries pretty quickly so it’s a nice “express” mask or you could prolong the process by spritzing a hydrosol on to keep it damp. Rinse off with a washcloth and continue with the the potions. Phew. 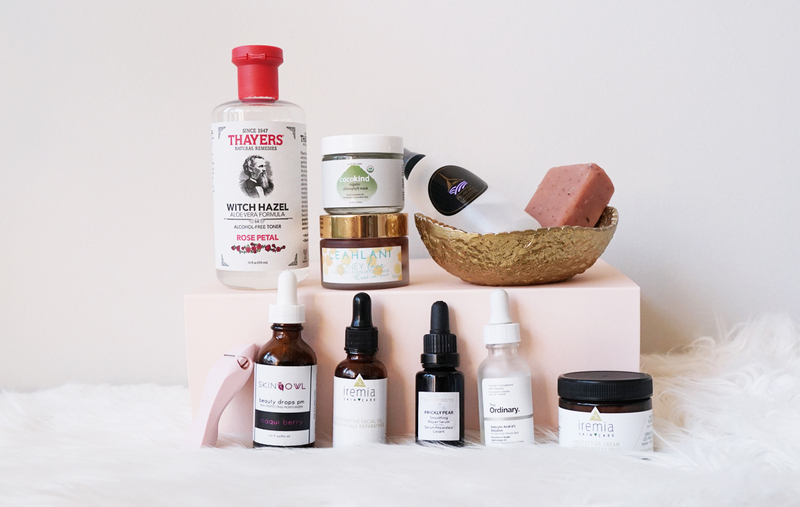 That was a long read, but hopefully my experience and product recommendations can help someone who has been struggling with acne or looking for more natural skincare products. So let me know - can you relate to my acne story? Do you have any must-have products you swear by? And what else are you curious for me to spill?